The aquarist team of SeaWorld Orlando is providing round-the-clock care for three endangered loggerhead sea turtle hatchlings (Caretta caretta) this week. Looking at these tiny guys it's hard to believe that the carapace length of adult specimen in the southeastern U.S. is approximately 36 in (92 cm). The corresponding weight is about 250 lbs (113 kg). From hatchling to adult, a loggerhead increases its weight more than 6000 times! Park rangers in Cape Canaveral transported the miniature turtles to SeaWorld. Rough seas caused by Hurricane Bill prevented the trio from trekking successfully from their nest in the sand to the waters. Only a week old they are so tiny, that they have almost no chance to survive such bad weather conditions. 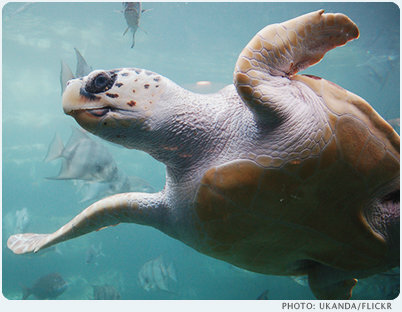 SeaWorld has breeding programs to save endangered species from extinction. Once the seas calm down, the team from SeaWorld plans to return the turtles to the wild off the coast of Juno Beach in Jupiter, Florida. 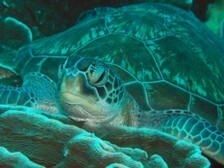 Loggerhead turtles are protected by various international treaties and agreements. They are classified by the IUCN as an endangered species. 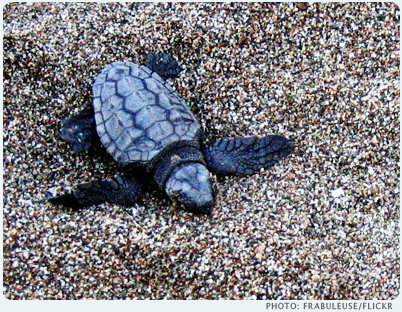 Every year hatchlings face many obstacles during their journey from their nest on the beach to the shoreline. Apart from predators on land and at sea, also habitat changes caused by humans play a role. Artificial lighting (eg by large hotels that are close to the water), and noise from beach activities is so confusing for young turtles that they can lose their way and don't find the direction to the sea.